SPEEDWAY, Ind. – Mission accomplished, a record set, and a torch passed to the next generation. Kyle Busch set a Brickyard record for laps led and became the first driver to sweep both a NASCAR Sprint Cup Series and NASCAR XFINITY Series race from the pole in the same weekend, but the real symbolism of Sunday’s Crown Royal 400 at Indianapolis Motor Speedway didn’t come until the event was over. As Busch spun his No. 18 Toyota in a celebratory burnout and took his customary bows near the yard of bricks, Tony Stewart and Jeff Gordon slowly circled the track, driving side by side, waving to fans acknowledging their career accomplishments after what is expected to be their respective last appearances at the Brickyard. In heat that reached 130 degrees on the asphalt, Stewart recovered from a pit road speeding penalty to finish 11th in his retirement year, and Gordon ran 13th in what was an unanticipated substitute role for ailing Dale Earnhardt Jr. But Busch received his share of the applause, too, as fans have begun to acknowledge his ascent, at age 31, to the small group of elite drivers in NASCAR’s history. To say he accomplished his second straight weekend sweep of the Indy races emphatically is to understate the case. In a race that went 25 miles beyond its scheduled distance, thanks to a rash of late cautions, Busch led 149 of 170 laps, a record for the event. In the two-lap overtime shootout that decided the issue, Busch crossed the finish line an astounding 2.126 seconds ahead of Joe Gibbs Racing teammate Matt Kenseth, who ran second. “This Toyota was awesome today,” said Busch, who won his second Sprint Cup race at Indianapolis, his fourth of the season and the 38th of his career. 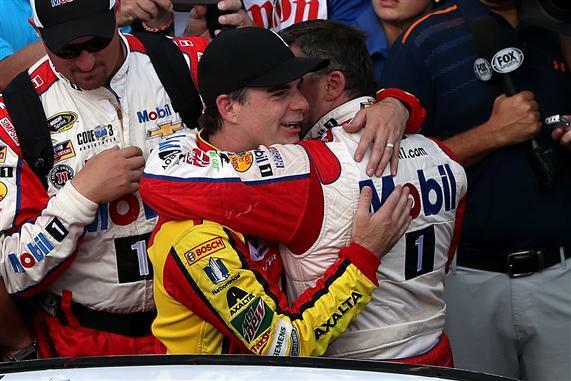 “It was just so fast and able to get out front and stay out front. Not even some of my teammates could challenge. This was hooked up and on rails. 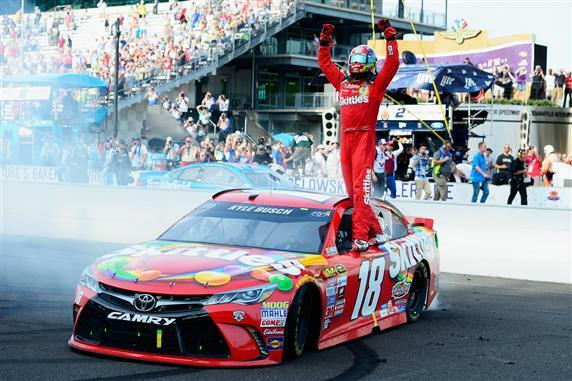 Busch is acutely aware of the history of the sport, and completing a weekend sweep by winning both races from the pole was high on his bucket list. “It’s so cool because it hasn’t been done before,” said the defending Sprint Cup champion, who is the second driver to win back-to-back races at the Brickyard—the other being Jimmie Johnson in 2008 and 2009. “I’ve tried and been successful at being able to do a lot of things that others haven’t been able to do before. I guess I give myself more chances than others because I run more of those (XFINITY) races. Busch was on cruise control, heading toward an easy victory, when NASCAR called a debris caution on Lap 150 to remove a piece of sheet metal near the exit from Turn 2. One of six drivers who stayed out on older tires, Busch led the field to green on Lap 154. Moments later, the No. 19 Toyota of Joe Gibbs Racing teammate Carl Edwards tightened up in the inside lane, twitched out of control and ignited a five-car wreck that necessitated a stoppage that lasted 7 minutes, 25 seconds. “It felt like I just got tight down there,” Edwards said. “I had a little trouble there on the starts, and I got down there, we were fighting really hard for the bottom, and it felt like I got tight with whoever was on the outside of me. The following two restarts also brought cautions, the eighth and final one coming when Jamie McMurray made an ill-advised lane change in front of Stewart near the end of pit road and spun sideways off the front bumper of Stewart’s No. 14 Chevrolet, also collecting Ryan Newman and Brian Scott. When the race restarted on Lap 169, Busch cleared Joey Logano and Kenseth off Turn 1 and pulled away relentlessly until the finish. Johnson overcame a pass-through penalty for speeding on pit road to run third, followed by Denny Hamlin, another speeding penalty victim and the third JGR driver in the top four. Kyle Larson came home fifth, posting his fourth top five of the season. But the story of the day was the long good-bye from Stewart and Gordon, juxtaposed against the backdrop of Busch’s emphatic hello to greatness at the flag stand.